The Industrial Design Society of America (IDSA) has recognized NITECORE SRT9 for the first time as Finalist in the prestigious International Design Excellence Awards (IDEA) 2018. It has been evaluated by IDEA Jury of 32 designers among over 1,600 entries across 20 categories based on their design innovation, user experience and product functionality. As the most innovative global leader of LED flashlights and chargers, the honor has made NITECORE as a result become the first brand in the professional lighting and illumination industry to receive all four grand international design prizes, along with the German iF Design Award, Red Dot Design Award and the Japanese G-Mark (Good Design). As the newest member in the SmartRing Tactical Series, NITECORE SRT9 is designed as all purposes applicable for law enforcement, hunting, search and rescue. The CREE XHP50 LED is capable of emitting an output of 2,150 lumens and a throw of 246 meters while efficiently reducing heat generation and energy loss to extend the LED lifespan. Besides the blazing white light output, it is also amazingly equipped with multi-colored LEDs (red, green, blue and ultraviolet), red-blue police warning signal, Strobe and Location Beacon modes in such a compact body. The unique 3rd generation Smart Selector Ring provides an easy user interface. The tactical Tail Switch offers momentary or constant illumination while rotating the Smart Selector Ring can switch between different special modes and brightness outputs. The flashlight can endure an excellent runtime of up to 250 hours when powered by 2 x 18650 / 4 x CR123 batteries. Benefiting from unibody die-casting technology, the body of SRT9 directly forms the interior space including the battery compartment and other fixing components in order to minimize its size and increase its portability. As a unibody die-cast flashlight, SRT9 is endowed with crafting techniques on a par with F1 car engines and spacecrafts providing a lightweight, rigid and fast cooling body. Integrated ATR technology allows SRT9 to keep working for long hours under high output. The streamlined and ergonomic body shape makes the flashlight extremely easy to grip. IPX8 ratings (2m submersible) and 1-meter impact resistance makes it all-weather applicable to the complex outdoor environment. 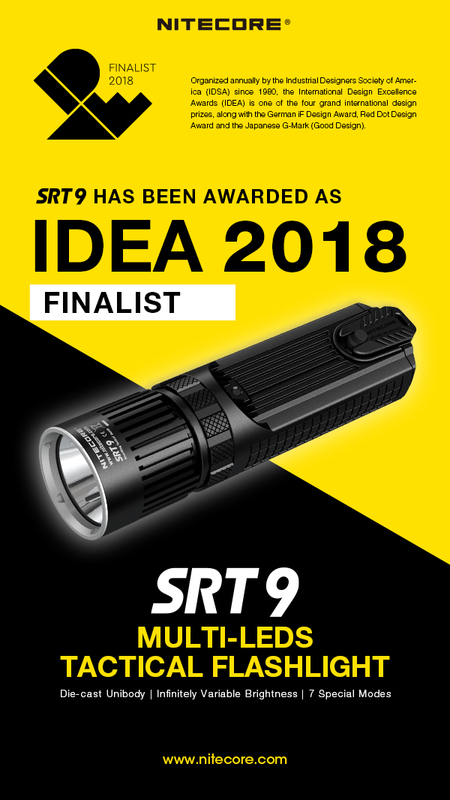 The innovative design concept of SRT9 has captured the hearts of the IDEA Jury and has again shown the incomparable power of NITECORE on product design and aesthetic functionality. Actually back in 2017, SRT9 was selected as one of Staff Picks for the EDC Flashlights for it is “a monster of a light that offers huge output and a plethora of versatile modes”. We believe in the maxim that design is nothing but a bold trial and an ingenious passion. 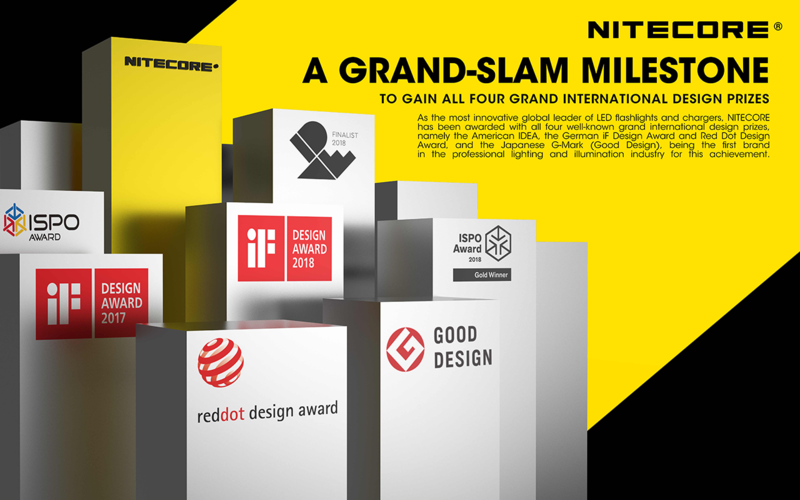 Since its foundation in 2007, NITECORE has been awarded with the four well-known grand international design prizes as well as other numerous honors. NITECORE will keep innovating and continue to release great hit products with the premium quality in the future.